Trung Khanh is a mountainous district in Cao Bang Province, 332km from Hanoi to the northeast with many beautiful landscapes and precious animals of the subtropical primeval forest. Standing at the peak of Ma Phuc Pass , 620 metres above sea level, it’s possible to see two stone blocks resembling a pair of horses standing face to face and a floristic composition covering the mountain and valley. Also, the 32km-long Quay Son River runs through the region, not only bringing silt to a large rice-growing area but also providing water for chestnut forests laden with fruits. The fruit, as big as rambutan, has many hard thorns and contains 3-4 chestnuts, each being 4-5 times bigger than the normal castanea. Talking about the most precious things in Cao Bang, everybody will remember about the Trung Khanh chestnuts, the best quality nuts which can only be found in Cao Bang. 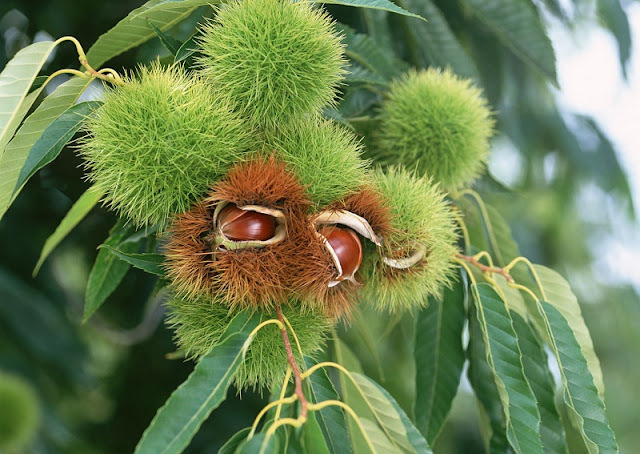 Tourists will remember the chestnut with its fleshy flavor, and it is easy to make. You can boil, fry, stew with pork, chicken, and the chestnut’s flavor will remain the same. The chestnut has tough shell, and it is hairy. When boiling or grill, you will easily detect the wonderful smell of the chestnuts. Sweet and fleshy, the chestnuts only appear in the end of autumn. Eating the hot chestnut in a cold day, you will know more about the forest, about the people in this land. The trees have existed in Trung Khanh District, about 62km from Cao Bang City, for thousands of years, said 98-year-old Ta Van Nam. Nam said his ancestors had grown the trees and the job had been handed down through the generations. “Thanks to the cool climate and favourable land, Trung Khanh chestnuts are well known far and wide,” Nam said, noting that apart from boiling and frying them, Cao Bang housewives used them as the main ingredient to cook many dishes, such as chestnut stewed with pork leg, chestnut pudding, chestnut porridge and particularly chestnut mixed with cốm (young sticky rice) made from Pì Pất sticky rice - a special rice planted by Tày ethnic people, which is very soft and fragrant. 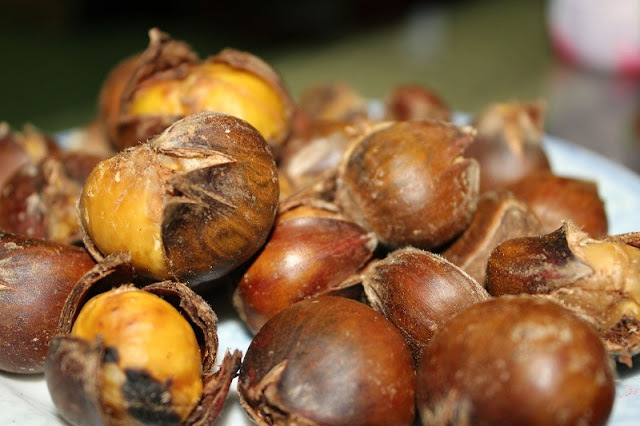 Trung Khanh chestnuts are one of the nation’s tastiest and meatiest fruits. They have won a following among locals and foreigners.